Madison Square Garden has hosted its fair share of famous sporting events since its construction; however, for more than a decade, “The World’s Most Famous Arena” has not had much to celebrate. Despite its enormous payroll, a series of bad decisions and the wrong mix of talent practically led to the demise of the New York Knicks after their appearance in the 1999 NBA Finals. For almost all of the 21st century, the city and its devoted fans have endured losing season after losing season as the Knicks plunged into irrelevancy in the basketball world. However, with a few prominent free agent signings and a blockbuster trade, as well as the emergence of Jeremy Lin and a coaching change, the buzz has returned to The Garden, a much-deserved turn of events for America’s greatest city and some of the nation’s best fans. The Garden itself is something to marvel at, let alone some of the spectacles that take place within it, which include, among others, Knicks and Rangers games, the Big East Tournament, and Barnum and Bailey’s circus. Situated in the heart of Manhattan on top of Penn Station, MSG seems to reflect the overall feel of New York City in which everything is larger than life. The structure itself climbs several floors from ground level, including a world-renowned theater in addition to the basketball arena, and with the adjacent Penn Plaza office building, the complex forms a landmark in the center of the city. An architectural achievement in its own right, the arena offers a unique view for its spectators, as secondary and tertiary levels extend out horizontally more so than climbing vertically, creating a bowl-like shape for the arena that keeps fans closer to court level even though they may be seated farther away. The city has recently spent hundreds of millions of dollars in renovations to improve The Garden and the experience for its fans. New York has long been known as the Mecca of Basketball, where children grow up playing basketball in playgrounds juxtaposed with large commercial buildings and residential complexes throughout the city’s several boroughs. Although that image of kids honing their skills on the concrete courts during the summer may now be more of a nostalgic thought than the reality of AAU, travel teams, and personal trainers, basketball still remains at the forefront for New Yorkers who flock to MSG to watch their team play. The Knicks have taken their fans on a roller coaster ride of sorts this season, underachieving and not meeting their high expectations at first, rejuvenating their squad around Jeremy Lin’s rapid rise to stardom, and overcoming the latest speed bump by changing coaches and embarking on a significant winning streak as the postseason draws closer with each game. The Knicks pertinence is important for the sport as a whole. Not only does the team draw an enormous and passionate fan-base and play in the largest market in the world, but players from other cities also relish the opportunity to play at MSG. When the Knicks are among the elite teams in the NBA, it makes for great rivalries with cities around the country and their superstars. As a lifelong Celtics fan, it has been a long-awaited development for the two divisional opponents to play each other with talented rosters. It’s not quite on the level of the Red Sox-Yankees rivalry, and may very well never be, but the Knicks re-emergence as a contender has sparked the beginning of a rivalry between two great cities located only a couple hundred miles from each other with fans equally passionate about their respective teams. Caught in the middle of the Knicks return to relevance are Jeremy Lin and his journey from an Ivy League standout to an undrafted free agent to one of the symbols of the NBA. His story has already been told and re-told thousands of times, so it is not worth commenting on the hardships he had to overcome, the Tim Tebow comparisons, or the frenzy in general. The takeaway from Lin’s story though, is that perseverance and dedication matter just as much as skill and talent, and when those attributes meet an opportunity, good things happen. Few believed Jeremy Lin would ever be patrolling the parquet of Madison Square Garden or the focus of the worldwide media hysteria aptly titled, “Linsanity,” but he did, and that is all it took for him to live out his dream and inspire the Knicks to reclaim the sport for its city. My younger brother recently had the opportunity to watch the Big East Championship Game at The Garden. As natives of Boston, we have been to several Celtics games at our “Garden,” the Boston Garden, or the TD Garden as it is called today, but until this year’s March Madness, neither of us had ventured into enemy territory to catch a game at MSG. My brother sent me the picture below with the comment, “This place is unreal. I feel like I’m watching a movie.” And that pretty much sums up the experience at Madison Square Garden…every night is a show and now the Knicks are back to performing for all of New York and the world. 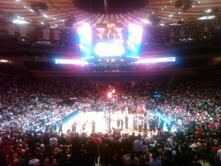 A look at the court of MSG during the 2012 Big East Championship Final.